The lake was calm and there were wispy fingers of fog rising off the surface of the water. The morning was was cool but not cold a wonderful freshness was in the air. From across the bay I could hear an outboard start and then make out the outline of a single person and a dog as they startedout across the bay probably going to his favorite fishing hole. Sitting at the end of the gas dock was out resident Blue Heron. Priceless! I never thought that I would ever welcome a full day of rain! The rain was off and on all day today. It was welcomed by almost every country dweller and farmer. Lawns, pastures and wells for most of us were parched and were screaming for moisture. Over the several hours you could see the grass turn from a parched yellow to green. The tree leaves seemed to look more vibrant; the native flowers in the meadows and imported flowers plants in gardens and planters perked up immediately. The air was fresh and and cool. I swear that even our goats and donkey were pleased. The the lake level rose ever so lightly but it was welcomed. All in all a great day. What a summer so far, the weather has been fantastic for cottaging. Enjoy the fresh air, the sun, the country sounds and the beauty of Rice Lake. The grass is showing signs of stress and some rain would be nice. Especially one of those warm summer rains. Now just mellow out, find a book, and get into a serious reading state. Yes we have a lending library with all kinds of books I’m sure that one is just perfect for you. I can remember when I was a kid, growing up in the little sleepy community of Woodlands playing in the warm summer rain. Now that was a flashback! Given the chance I bet todays kids would do the same. The long weekend is comeing up fast, no rain in the forecast and we still have a couple of openings. It’s a great time to have some “family time” here at Highland View Resort. The breeze from the lake is refreshing. The summer sounds are everywhere. Watch the Ospray as it glide over the bay and dive into the water from their perch in the sky. If it is lucky, it will explode from the water, labouring to get back into the air with a fish firmly grasped init’s talons. Summer is a great time to be out in the country. Even if it is only for a few days you should get out of the city! Want a better place to be during this heat wave, the choice is simple it’s Highland View Resort “The Perfect Family Resort”. 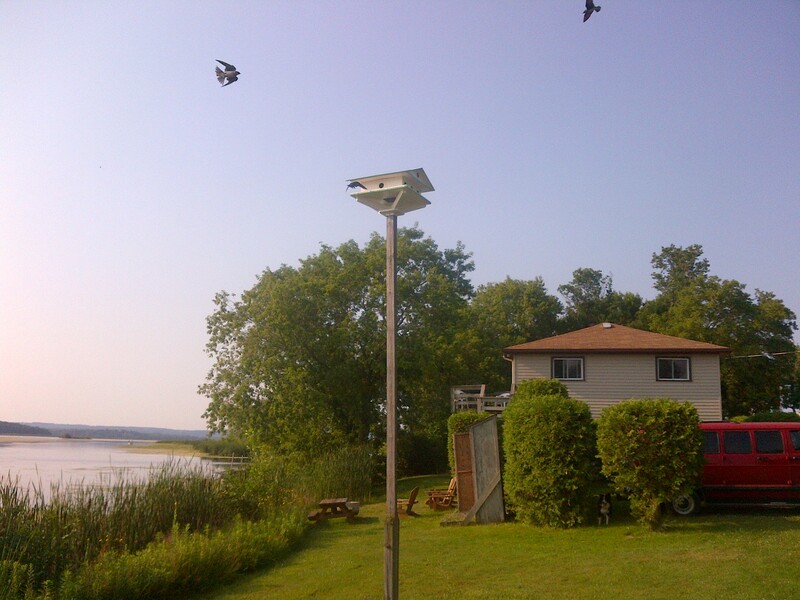 Only 90 minutes from Toronto, Highland View is a modern cottage rental resort on Rice Lake with all the comforts of home. It’s the perfect cottage setting for just plain relaxing and taking in quality family time while enjoying the summer. The clowns of the bird world. The days are warm, the pool is inviting, the kids have loads of activities to keep themselves amused, mom and dad will have some time for themselves. Rent a boat, take a tour of this historic lake, take the kids fishing, or just RELAX. The cool evenings are great for a family camp fire. Things can’t any better than this. 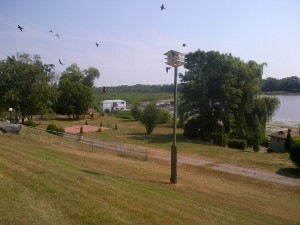 Fresh clean country air, the sounds of nature not traffic, family time and relaxation. Highland View Resort is The Perfect Cottage Destination to spend some time at with the family. There are still spaces open so you can enjoy all that Rice lake has to offer at an affordable price. Evenings are perfect to enjoy a camp fire roast marshmallows, make a couple of smors, perhaps tell a couple of ghost stories all while seated around your own camp fire. Make new friends or just enjoy a special time with your family. Plenty of activities,; kids program, swimming pools,kids fountain pool by the beach, free use of canoes, kayaks, peddle boats, and more. Spend as little as 2 days or several or more here with us on Fabulous Rice Lake. 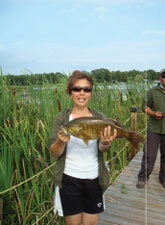 Kids love to fish so you can take advantage of the Ontario’s next Family Fishing Week is July 7-15, 2012. 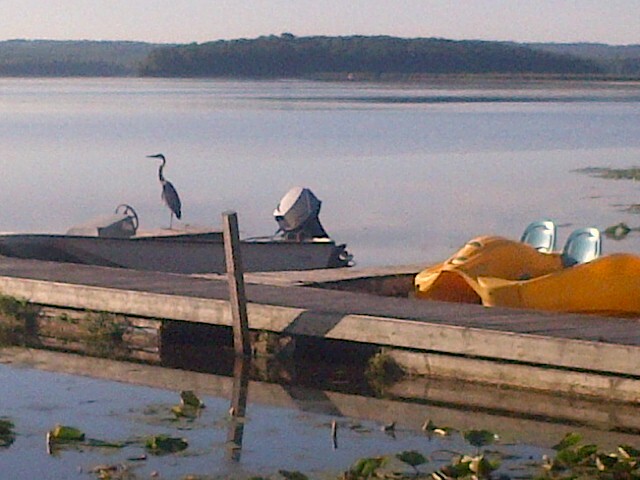 Fish off the docks or rent a boat and enjoy the ecology of our beautiful and historic lake. There is still some openings, give us a call to see how affordable we really are.